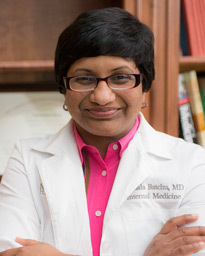 Dr. Vishalakshmi Batchu received her medical degree from Siddhartha Medical College in India. She then completed her residency training in internal medicine at Wyckoff Heights Medical Center (an affiliate of the Weill Medical College of Cornell University) in Brooklyn, New York, where she served as chief resident. Board certified in internal medicine, Dr. Batchu has clinical interests in diabetes, hypertension and chronic medical illnesses .In practice since 2009, she treats patient 18 years and older and speaks Hindi. Dr. Batchu emphasizes preventing medical problems and encourages her patients to develop and maintain healthy lifestyles. She believes in making herself available to her patients, taking her own calls and visiting her patients who are in the hospital or a nursing home. Dr. Batchu lives in Pearland with her husband and daughter. Her favorite leisure activities are cooking, reading, running and yoga.